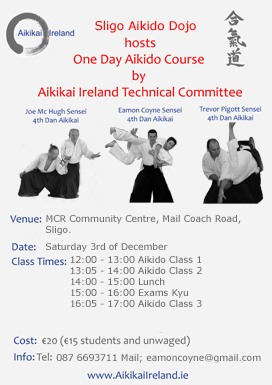 On Saturday 3rd of December Sligo Aikido Dojo will host a seminar which will be given by Aikikai Ireland Techncial Committee members Joe McHugh 4th Dan, Eamon Coyne 4th Dan and Trevor Pigott 4th Dan. 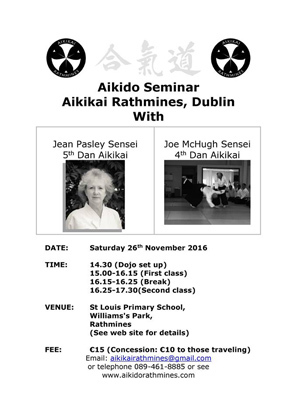 On Saturday 26th of November Jean Pasley Sensei 5th Dan from AikikaiRathmines and Joe McHugh Sensei 4th Dan from Ikeda Dojo Wicklow will host a one day seminar in Aikikai Rathmines Dublin. St. Louis Primary School, Williams Park, Rathmines. 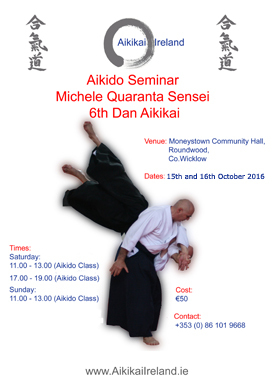 Aikikai Ireland Technical Adviser Michele Quaranta Shihan 6th Dan will give another Aikido seminar in Moneystown Community Hall, Wicklow on the 15th and 16th of October. This will be third of seminars of 2016 with Michele Shihan. 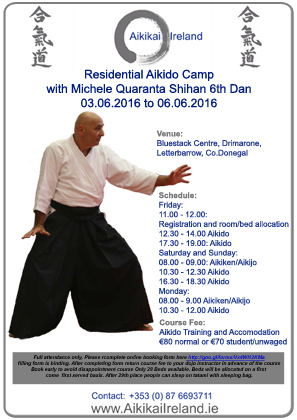 3rd, 4th, 5th and 6th of June 2016 Michele Quaranta 6th Dan Shihan Residential Summer Camp in Bluestack Centre, Donegal. Michele Quaranta Shihan will teach at the 4th Aikikai Ireland Residential Summer Camp in the Bluestack Centre in Drimarone, Donegal. 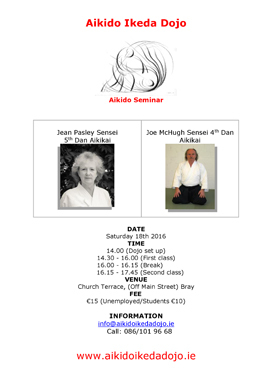 The course is proudly hosted by Sligo Aikido Dojo. The past 3 seminars have been a great success and we look forward to this years seminar already. Participants can look forward to great Aikido training, eating, sleeping and training in the one secluded area, nestled nicely in the Bluestack Centre in the centre's namesake mountain. The course offers students to train in an enviroment away from distractions and as a result enjoy the training all the more with our fantastic Technical Adviser Michele Shihan. Aikido Training and Accomodation only €80 normal or €70 student/unwaged. On Saturday 18th of June the third collaboration between Jean Pasley Sensei 5th Dan Head Instructor Rathmines Aikikai and Joe McHugh Sensei 4th Dan head instructor and host of Ikeda Dojo Wicklow (Aikikai Ireland). All Aikidoka welcome to attend this course between these 2 Sensei which promises to be another great days training. 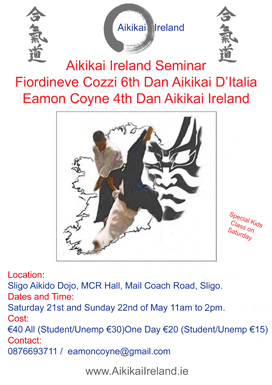 21st and 22nd of May Fiordineve Cozzi 6th Dan Aikikai D'Italia / Eamon Coyne 4th Dan Aikikai Ireland seminar in Sligo. Sligo Aikido Dojo will once again have the good fortune to host Fiordineve Cozzi Sensei 6th Dan Aikikai D'Italia and his lovely wife Rosella Lamboglia 3rd Dan Aikikai D'Italia and some of his students from around Italy. The seminar will also see host dojo instructor Eamon Coyne 4th Dan Aikikai Ireland teach too. Fiordineve Cozzi Sensei is renowned for his kids classes and is responsible for the Aikikai D'Italia kids programme DVD and will give a special kids class at the seminar in Sligo too. .
We look forward to having you all here in Sligo again. On Saturday 7th of May a first time collaboration between Ray Butcher Sensei 4th Dan head instructor at Henshin Aikido Dojo (Balance Ireland) and Joe McHugh Sensei 4th Dan head instructor and host of Ikeda Dojo Wicklow (Aikikai Ireland). All Aikidoka welcome to attend this course between these 2 Sensei which promises to be a great days training. 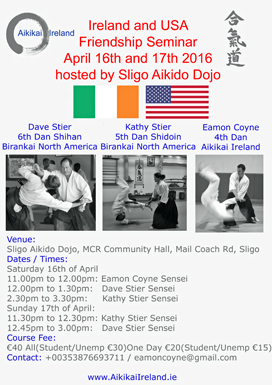 16th, 17th of April 2016 Dave Stier 6th Dan Shihan and Kathy Stier 5th Dan Shidoin of Green River Aikido Massachussets, USA and Eamon Coyne 4th Dan Sligo Aikido Dojo. Sligo Aikido Dojo has the pleasure of announcing an international Aikido Friendship Seminar between the USA and Ireland, coming to teach in Sligo are Dave Stier 6th Dan Shihan Head instructor of the Green River Aikido Dojo in Massachusetts, USA and also Kathy Stier 5th Dan Shidoin also of Green River Aikido Dojo. Green River Aikido Dojo is a member of North America Birankai. Sligo Aikido Dojo had the pleasure of a vist from Green River student Valarie NcGettigan last year, Valarie will be back for the seminar along with fellow Green River Aikidoka Brian will travel with Dave and Kathy to train with us. We look forward to this chance to train with the people from Green River Aikido in Sligo Aikido Dojo. Unno Sensei, and continued under Paul Sylvain Shihan and Lorraine DiAnne Shihan, both students of TK Chiba Shihan. In 2011 Chiba Sensei officially accepted Stier Sensei as his own student, and welcomed Green River Aikido as active members of Birankai North America. Kathy Stier Sensei, 5th Dan, began her Aikido training in 1981 under Paul Sylvain Shihan and Lorraine DiAnne Shihan, both of whom trained at Hombu Dojo and were apprentices to TK Chiba Shihan. She is a certified Shidoin of Birankai North America and Director of children's programs at Green River Aikido. 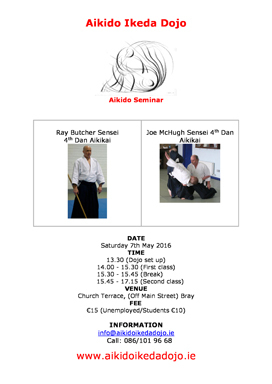 On Sunday 25th of April Athboy Aikido Dojo will host a seminar which will be given by Aikikai Ireland Techncial Committee members Joe McHugh 4th Dan, Eamon Coyne 4th Dan and Trevor Pigott 4th Dan. Athboy Aikido Dojo, St.James Hall, Main Street, Athboy. 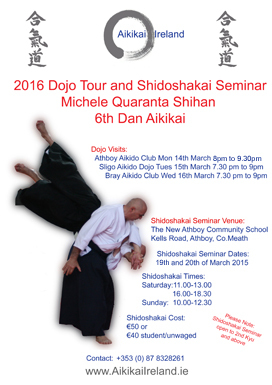 Aikikai Ireland have great pleasure in announcing that Technical Adviser Michele Quaranta Shihan will do a dojo tour and also give a Shidoshakai Seminar in March 2016.